Mecalac’s new site dumper range is available in both six and nine-tonne payloads. 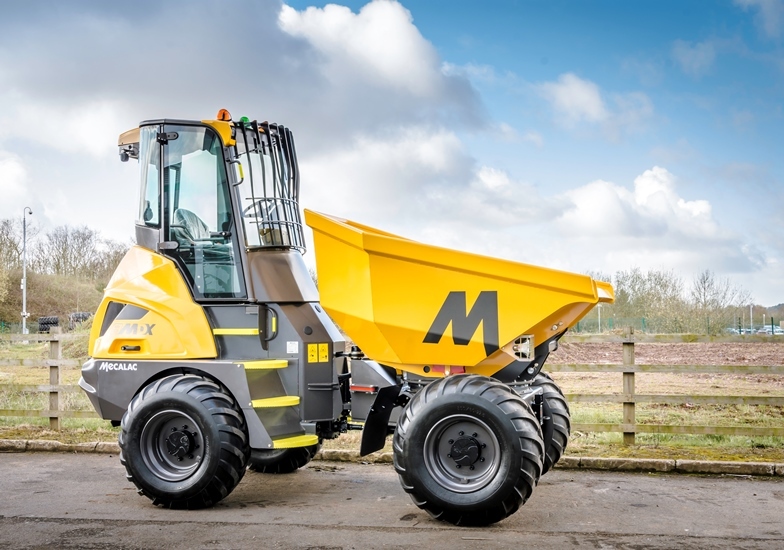 Mecalac Construction Equipment UK has revealed the full technical specifications of its MDX cabbed site dumper range. The new range features a Stage IIIB-compliant engine, new dashboard design and a ‘ground-up’ focus on site safety features. Available in both six and nine-tonne payloads (6MDX and 9MDX respectively), each model pairs aesthetics with operator functionality. The 6MDX has an operating weight of 4,950kg and boasts a top speed of 28kph. The 9MDX offers similar statistics, with a narrow body width for effective operation in tight spaces. Both models adopt a 3.4L, 55kw Perkins 854 IIIB-compliant engine, generating 424Nm of torque. Next generation Power Brakes, driven by the main hydraulic system, deliver an improvement in pedal feel and braking effort. High-visibility access steps assist safe entry and exit for operators, while flashing green seatbelt beacons, LED work lights and protected tail lights increase visiblity on site.